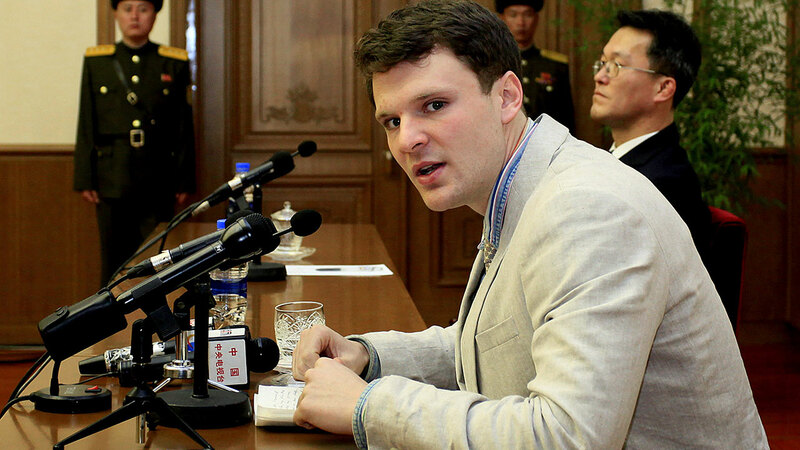 American student Otto Warmbier speaks as Warmbier is presented to reporters Monday, Feb. 29, 2016, in Pyongyang, North Korea. WASHINGTON -- An American college student whose parents say he has been in a coma while serving a 15-year prison term in North Korea was released and returned to the United States Tuesday as the Trump administration revealed a rare exchange with the reclusive country. An airplane carrying Otto Warmbier, who's from Ohio, arrived in Cincinnati shortly before 10:20 p.m. Two ambulances were parked near an airport hangar. Warmbier's release came during a visit to North Korea by former NBA star Dennis Rodman, one of few people to have met both North Korean leader Kim Jong Un and President Donald Trump. Department of State spokeswoman Heather Nauert told reporters Rodman had nothing to do with Warmbier's release. Rodman had told reporters before arriving in Pyongyang that the issue of Americans detained by North Korea is "not my purpose right now." Warmbier, a 22-year-old University of Virginia undergraduate, was convicted and sentenced in a one-hour trial in North Korea's Supreme Court in March 2016. He was sentenced to 15 years in prison with hard labor for subversion after he tearfully confessed that he had tried to steal a propaganda banner. Tillerson announced that the Department of State had secured Warmbier's release at the direction of the Republican president. He said Warmbier, of Wyoming, in suburban Cincinnati, was en route to the U.S.
Warmbier's parents, Fred and Cindy Warmbier, said he was in a coma and was flying home. They said they were told he has been in a coma since his trial, when he was last seen in public, and they had learned of this only one week ago. In Wyoming, resident Amy Mayer said news of his release had sent waves of shock and joy through the neighborhood. It's unclear if Warmbier's release during Rodman's visit was purely coincidental. Rodman has traveled to the isolated nation four times since 2013, attracting a lot of publicity, much of it unfavorable. In 2014, Rodman arranged a basketball game with other former NBA players and North Koreans and regaled leader Kim with a rendition of "Happy Birthday." Rodman's current trip is his first since Trump, his former "Celebrity Apprentice" boss, became president. He told reporters in Beijing, as he departed for Pyongyang, that he hopes his trip will "open a door" for Trump. - Kim Hak Song, who was detained in early May to be investigated for committing unspecified hostile acts, North Korea has said. He worked at the Pyongyang University of Science and Technology. - Tony Kim, who also goes by his Korean name Kim Sang-duk, was detained April 22 at the Pyongyang airport. He had also taught at the university. He was accused of committing unspecified criminal acts intended to overthrow the government. - South Korean-born U.S. citizen Kim Dong Chul, who was sentenced in April 2016 to 10 years in prison with hard labor after being convicted of espionage. AP reporters Josh Lederman and Ken Thomas in Washington, Eric Talmadge in Pyongyang, North Korea, Daniel Sewell in Cincinnati and video journalist Sara Gillesby in New York contributed to this report.